As we sit inside trying to stay warm and thinking about the coming of spring, the sap is thinking it’s soon time to pack its bags and begin the trip up and down the tree. Chief of Maple Syrup Operations, Bob Hanson, said that according to his accuweather predictions, the sap will start to run at 3:17 pm on March 14. So his plan is to get organized and begin tapping trees the week of March 11. The popular and scenic Hallaway Hill overlook trail has offered an exceptional hiking experience with breathtaking views of the Mapleleaf hills for generations of park visitors. The trail has been very heavily used and “appreciated” so much that rerouting the trail is necessary to address safety issues as erosion is threatening the integrity of the existing trail. The new alignment will provide for a safer, smoother, and sustainable route to the top of the most popular hiking trail in Maplewood State Park. Friends of Maplewood contributed $15,000 to support this project. In partnership with other funding sources, it has enabled the DNR to proceed with accomplishing the realignment and improvement of the beloved trail. 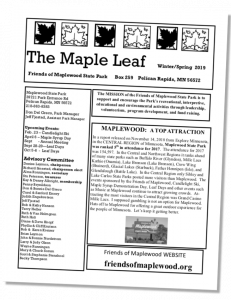 Check out Friends of Maplewood’s full newsletter to learn more about these initiatives and more!